First Port Ellen and Brora, now Rosebank… the vogue for reviving ‘lost’ distilleries continues. The Falkirk plant – currently just an empty shell – may be producing spirit within a couple of years under new owner Ian Macleod Distillers. Richard Woodard investigates. There are ghosts walking among us… We’re not even halfway through the week, and already three ‘lost’ single malt Scotch whisky distilleries are set for revival. On Monday it was Port Ellen and Brora, on Tuesday it was Rosebank. Who knows what the rest of the week might bring? If Diageo’s plans for Port Ellen and Brora were a bolt from the blue, the resurrection of Rosebank has been rumoured for some time. 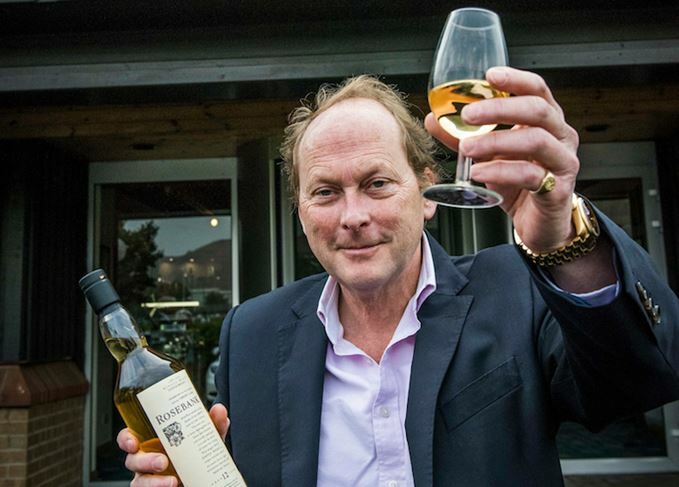 Here, it was the identity of the new operator – Glengoyne and Tamdhu owner Ian Macleod Distillers – that was the surprise. Rosebank’s quintessentially Lowland style of single malt, triple-distilled and famed for its floral, high-toned elegance, has made it almost as much of a cult favourite among collectors and connoisseurs as that redoubtable Diageo double act. The plant closed in 1993, a decade later than Port Ellen and Brora, and, unlike those two, it wasn’t shut down because its spirit was unwanted; then owner UDV (now Diageo) was reluctant to pay for remedial works to the site’s effluent treatment plant, and there were reported problems with road access. By 2002, Diageo had sold the site to British Waterways (it sits astride the Forth & Clyde Canal); the old maltings were redeveloped and, although there were plans to revive production, Rosebank’s stills and mash tun were stolen during the Christmas and New Year break of 2008/9. More recently, rumours have swirled about Rosebank’s return, but the huge sticking-point for those who looked at the site was the fact that Diageo still owned the Rosebank trademark. Now that has changed. Why didn’t Diageo do it, in that case? ‘Had they still owned the site, I can imagine that they would. They might have been announcing a “holy trinity” yesterday of Brora, Port Ellen and Rosebank,’ says Doctor. In terms of that site, Ian Macleod is essentially buying an empty shell following the theft of the equipment. Plans – which could cost £10-12m, Doctor estimates – include the installation of a set of three stills for Rosebank’s triple distillation regime, plus worm tub condensers. Rosebank’s planned production capacity will be similar to that of the ‘new’ Port Ellen and Brora: between 500,000 and 1m litres of alcohol a year, almost certainly entirely ring-fenced for single malt. Ian Macleod, like Diageo with Port Ellen and Brora, has already pledged to recreate as far as possible the historic style of Rosebank whisky – not easy when none of the kit is left in the distillery. ‘We will go back to the drawings that we will get from Diageo with Abercrombies [the coppersmith] and make sure it’s all built exactly the way it was,’ says Doctor. He believes the records are detailed, but admits that there will be some ‘trial and error’ in the early days of the new plant. It will be some time before we see whisky from the ‘new’ Rosebank, however. ‘I don’t think we’ll be bottling any new make, unlike some others,’ says Doctor wryly. ‘Nor will we be bottling it on its third birthday. As with Port Ellen and Brora, much intrigue will surround the cask policy at the revived Rosebank – an area that has developed hugely in single malt terms since the 1980s and 1990s. For the moment, the company has Diageo’s existing stocks from the distillery to market and sell – all of it distilled in the late 1980s and early 1990s, none of it less than 25 years old. Casks need to be investigated; bottles and labels designed. It’s unlikely that we’ll see a release of old Rosebank stock until some time in 2018. In the meantime, and as detailed plans are drawn up for the distillery’s new beginning, Doctor has just one more task on his already lengthy to-do list: finding and acquiring more casks of Rosebank. ‘There’ll be other stocks out there with independent bottlers and so on,’ he says, ‘and it’ll be my job to try to repatriate them.